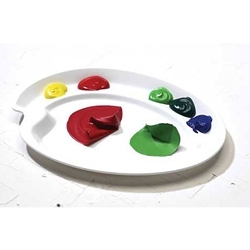 This white, two-level palette measures 7.75"w x .75"d x 10.5h. It is made of sturdy impact plastic that allows for easy clean up. Dried acrylics peel off, and oils wipe off easily.